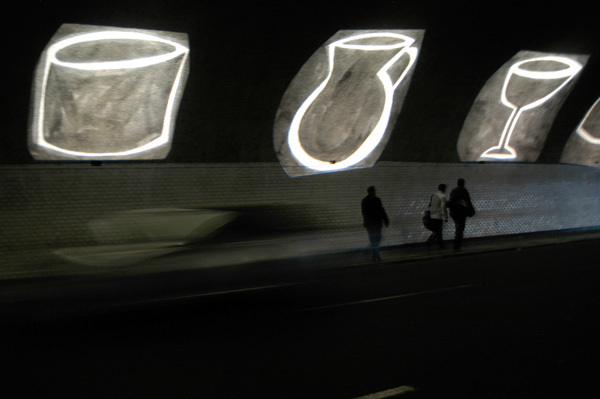 “retorts” is a lasting luminous installation, springing from the traditional plays of lights and shadows in Arabian architecture and enriched with the imaginary of contemporary artists working all over the world.It takes place right in the heart of Algiers : the famous Tunnel des Facultés. 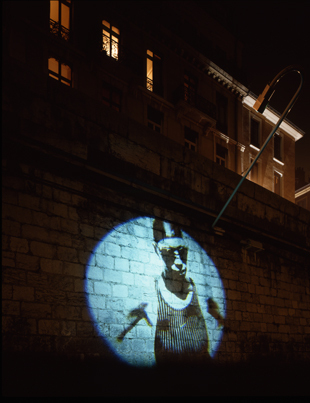 Designed by artists whose formal and symbolic research is about light and shadow, these light etchings have crossed the planet to carve here, in the womb of Algiers, a multifarious imagery, evocative of both the particular and the universal. 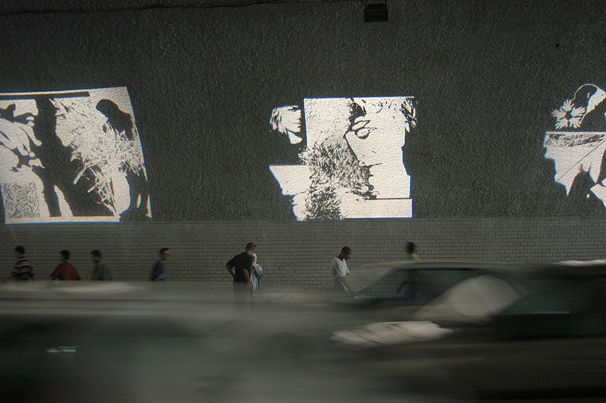 The guest artists are Rachid Koraïchi, Daniel Laskarin, Farid Belkahia, William Kentridge, Gonçalo Ivo, Ene Kull, Ammar Bouras, Liz Rideal, Pinaree Sanpitak, Jyoti Bhatt, Richard Prince, Abderrazak Sahli, Meelis Salujärv, Gülsun Karamustapha, Ester Grinspum, Manisha Parekh, Denis Martinez, Rekha Rodwittiya, Sumi Wakiro, Lu Shengzhong, Nicola Durvasula, Adel El Siwi, Adlane Djeffal, Jacqueline Fabien. 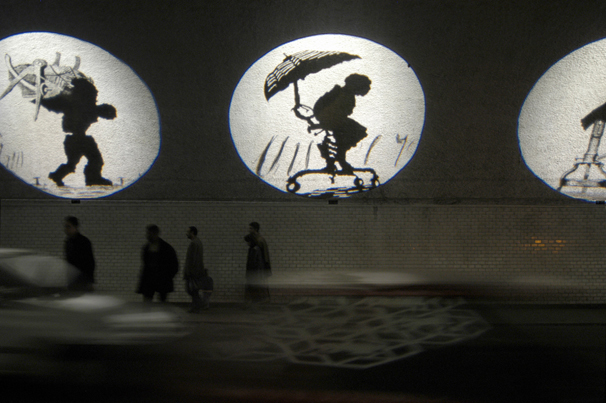 « retorts» is dedicated to the man-in-the-street, the tireless walker in the Tunnel des Facultés. I have spent so many hours watching him cross the Tunnel since my first visit in January 2002, guided in Algiers by Rachid Karachi! 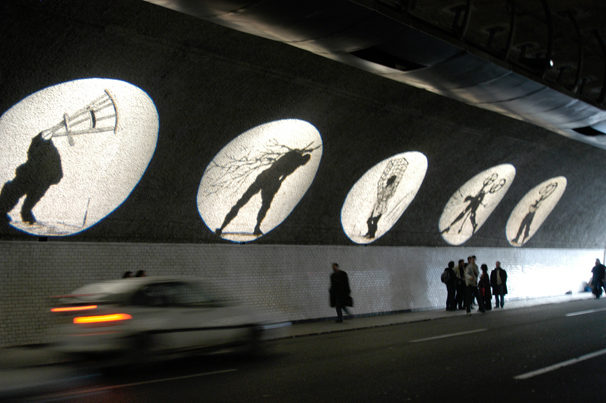 In turns easy-going, careless or exhausted, sometimes walking alone but most of the time in compact clusters swaying across together, it is never the same man nor the same woman who dives into the Tunnel and crosses the tube, immersed in the inner heart of Algiers, to re-emerge in the sun a few minutes later. 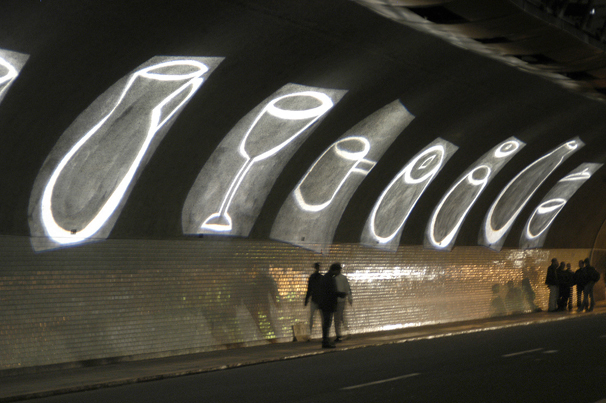 Maybe there is nothing unusual in the renewed experience, yet it brings one on intimate terms with the daily underground town, its ancient foundations and moods, the womb of dreams, shadows and lights. Lights, precisely! Now the passer-by will enter light, being totally immersed in it. Each crossing will be a unique experience to him as space will wrap him anew. Each carving of light will have crossed the planet to be inscribed here like a scratch or an etching, sometimes like a tattoo or a scar. For behind each work stands a sort of dazzling proliferation of the world, the dizzy diversity of life, there is an artist alive somewhere in the world, who from Cairo to Bangkok offers Algiers his own vision of light, his innermost recipe to tame shadow.For this first opus, here are the cocktails of shadows and lights from Ammar Bouras, then the dazzling epics of Rachid Koraichi, next the genii from the Egyptian Adel el Siwi, the cut out figures of Gülsun Karamustapha, and come from the Canadian Far West, Isle of Vancouver, the silhouettes of Daniel Laskarin. Other Opus will follow, testifying to other practices in the world, other frail subtle tricks transmitted from Johannesburg or from Baroda. 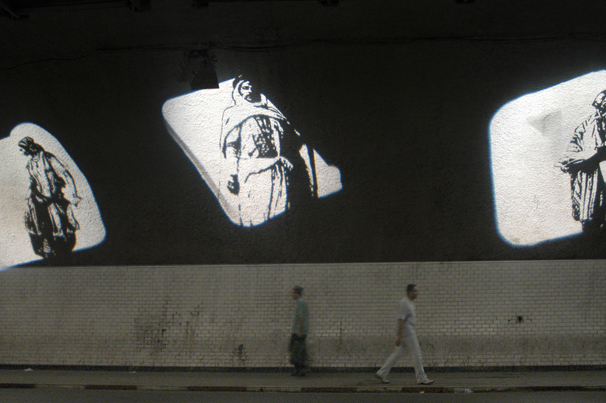 Those impalpable images, whose life lasts as long as they persist on the retina, will all the same deeply implant in the heart of Algiers a daily complicity with foreign lights. 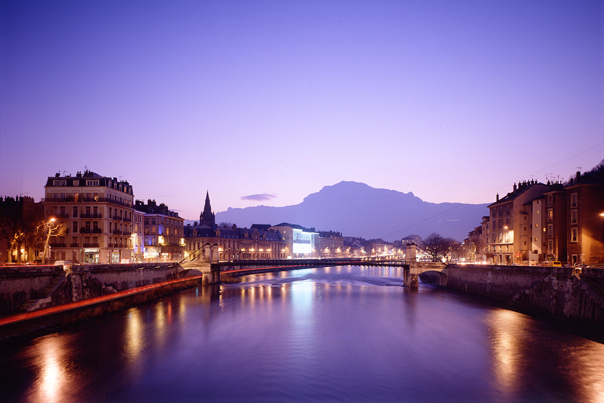 At nightfall, the quays along the Isère River, in the historical heart of Grenoble, open to the world. 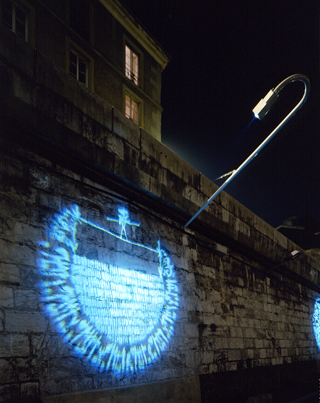 Fragile and impalpable images, simply made up of shadows and lights, drift along the stream, like a vast frieze underlining the town. 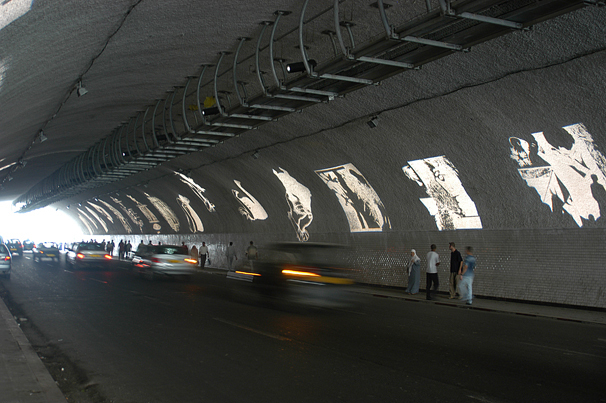 Once in Grenoble, the original images are integrated in an experimental technologic prototype designed on Gaz Electricité de Grenoble’s initiative in collaboration with Philips-lighting. 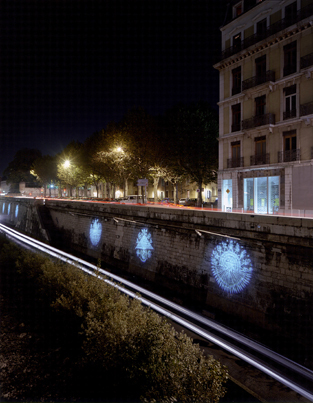 They are blown-up on the retaining wall of the quays by a discreet network of optical fibres. 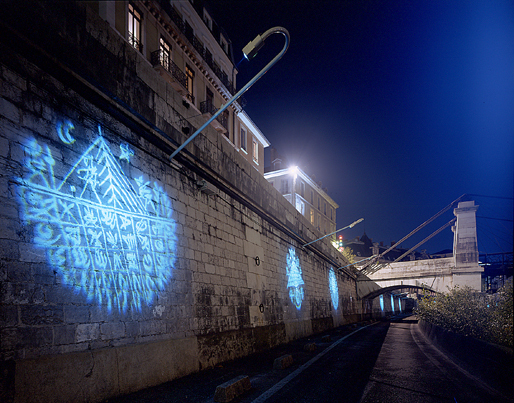 This installation allows the town to live a new and dreamlike life at night. They forgotten quays, exhausted by the intensive traffic, become a place of walk and harmony. What is the use of a river? What is the use of a river? The question is hardly ever asked. As for the sky and the earth its existence goes without saying. For a long time rivers have been viewed as a source of drinkable water, a free waterway moving downstream from town to town to reach the sea, as a reservoir of fish one may catch and water fowls one may hunt. Such are the folk tales, the human history of the river at the time of horse-drawn barges and of punts and craft. But rivers have other uses, more for games and less for work, to swim and dive and probe its intimate depths, to sunbathe on their small sand islands, to dream on their banks, imagine their estuaries, the seas into which they flow and the distant Polynesias. But Heraclites says : “The river is always a Here and a There.” Somewhere else, but also a language, the speech of riverbanks, friendly waters, mud islets, streams, deltas. This language puzzled me, this grammar of swirls and streams either slow or madly swift, waters running from different places.If streams lose their names as soon as they meet a river this doesn’t mean they also lose their distinctive water, I mean the very nature, the density, the singular personality of their water. This is the reason why every river has a history, almost an epic, a long run tale, an aquatic story. When it springs forth it is often but a trickle without a name, without a fate. But as soon as it asserts itself, carries on, digs its way into the incline of the slopes and is framed by the scenery, then it takes on a name, its own name, it can say “I”. But fast enough, while it flows down, others will join him, mingle their waters with his, and the river “I” will lose his identity and say “We” instead. And when this “We” reaches his end and is united with the sea, merges into the vastness of the ocean, he will then lose both his “I” and his “We” and become “All”. Surely there is, in the depths of the Atlantic, rivulets of water still tasting of the Loire, but soon absorbed, drowned into the cosmic taste of the sea, this taste of universal salt. A river is made up of a thousand different sources and his riches and his reason for being and flowing is the interblending of its waters. Every river is half breed and interbred. And I no longer want to be told about Roots! I well know the trees. I have grown and matured in their branches, but trees can tell us nothing other than their native soil. They know nothing of the whole world. The whole world can only be taught by rivers on this earth and by migratory birds in the sky. 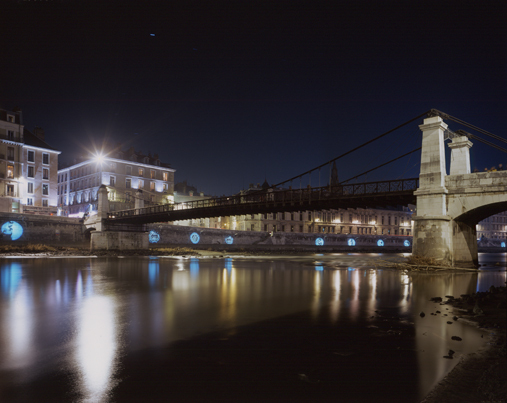 Rivers are migrating waters, messengers of the universal.